Our Fab Fash Life: The Perfect Mother's Day Gift!! Pink Perfection for Mother's Day! I've been wondering what to get my mom for Mother’s Day for a couple months now. I love sending her flowers but they die, and candy she loves but I always hear how she regrets eating it later. So I though and though ....what do you buy for one of the most important women in your life!? I don’t want to spend to much, she’s gets upset when I do that, so I did a little searching online and asked some of my friends what they where getting for the moms. Then whilst peeking on Instagram I found it....The Perfect Mother’s Day Gift!! My friend Mila makes the most beautiful scarves, and when I say makes the scarves I mean it..she is part of making every bit of each one. She even hand creates/paints the designs on the scarves, they’re her actual art work. Super impressive right? She’s super talented! As I took a further peek at her page I noticed she makes the coolest Mother’s Day boxes, and OMG they’re so so cute inside and out. You guys know how much I love pink so I’m a bit partial, so my mother will for sure know it came from me. Long story short I ordered one to take to her in Delaware when we go to see her for Mother's Day. The box includes 2 stunning scarves, one is a blanket size with and the other is a smaller hanky size. They’re both adorned with the cutest kissy rose design, on a bright magenta backdrop. There’s a candle with the same logo, and adorned with little sparklies There's also a second piece of artwork. I just love how she comes up with these stunning little pieces of art, and let me tell you the packaging is just as gorgeous as the contents. It’s so well decorated and wrapped that you can have it sent directly to mom, that’s the genius of the whole thing. You don't even need to add a card because the inner flap of the box has thee cutest card already included. 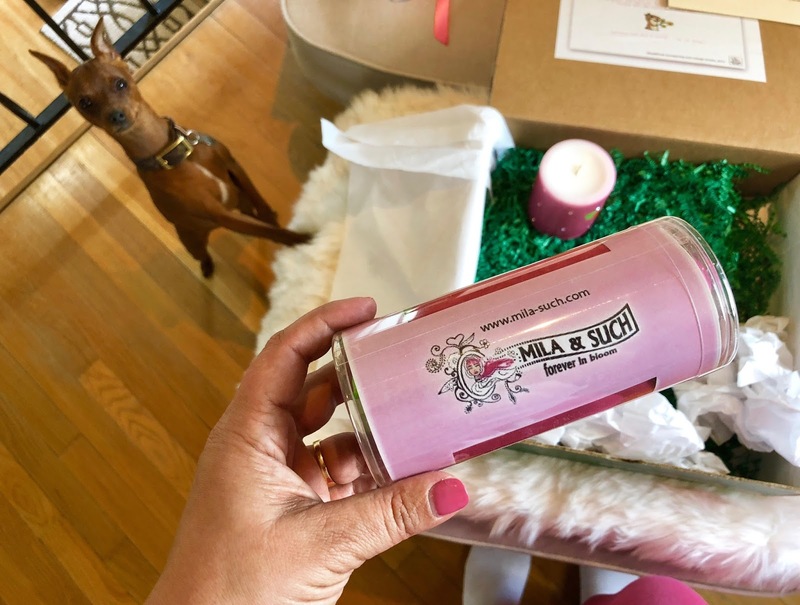 (Check out my unboxing video on IG) There are several different box combinations you can choose from, and then Mila will sent to your mom no matter where she lives. Plus they’re priced to perfection, so it won't be too hard on your wallet. It's a fantastic way to make your mom feel special, for more info on what the boxes include and how to get one for your mom, just go to @MilaSuchNyc on Instagram, or head on over to her website Mila-such.com. Note if you're not a pink person like me she has many different designs in many different colors, so there's something for everyone. There are even matching throw pillows, ugh it's so much cuteness! Don’t forget to tell her I sent you, just let her know you’re a friend of mine and she’ll take good care of you, she's an absolute doll! Don't forget to follow us on social media for more upcoming #giveaways! Mothers Day is a big one in my matriarch! I love these boxes! Perfect for my mom! love my mom and she would love these prizes! Beautiful scarf and nice packaging. Thanks for sharing a gift ideas for mothers day and i am sure this will be best gifts for mothers which ll bring smile on her face. what i found that flowers are missing here. what if we gives flowers as a gifts? here is the different options for it. Lovely, So nice gift idea for Mother's day, this year I will giving flower bouquet to her, she love the flowers most, now we can send flower bouquet online, they are fresh and well designed, see this site to get more ideas of flower bouquet, you will find it helpful. brill mother's day prize,for any mother. I am so behind! Mothers Day?? Already?? Very cool! And thanks for the chance at the giveaway! this is really lovely gift for mother, on the occasion of Mother's day, i am going to surprised her by giving her favorite flowers bouquet, flowers are always the best option in gifts to expressing our love, book a flower for special person from this See more, they are having some good ideas of gifts for Mother's day. Amazing blog! This is perfect gift ideas to surprise our mother on mothers day.you can see this site also to celebrate mothers day unforgettable with best choices of gifts. That red candle is so pretty! Unique! This inspires me to get creative! I Love getting gifts from my daugthers on mother's day but for me on mother's day i'm sad because my mom been gone since 2006. Awhhh I’m sorry to hear that Hun!! I love the Forever in. Bloom candle. It is so beautiful. What a beautiful giveaway! My mother would love this! Mother's Day is a very hard day for me. My mom passed away suddenly at 49 years old 48 years ago. I had a six month old son and was pregnant with my second child. I have never really celebrated Mother's Day since. I now have a grown son, 2 grown daughters and 7 grandchildren and I need something to smile about on Mother's Day because I usually spend that day in bed, crying. This makes me want to start making collage greeting cards again! This is a great giveaway. A very good prize. This would be such an awesome idea for my mom. She would love the handmade items , they’re very cute . Thanks for the idea . I love the beautiful pink scarf. It’s a beautiful color for spring. I had renewed my love of all things pink! Now this is something that my mom would go wold for. Love this mother's day post. 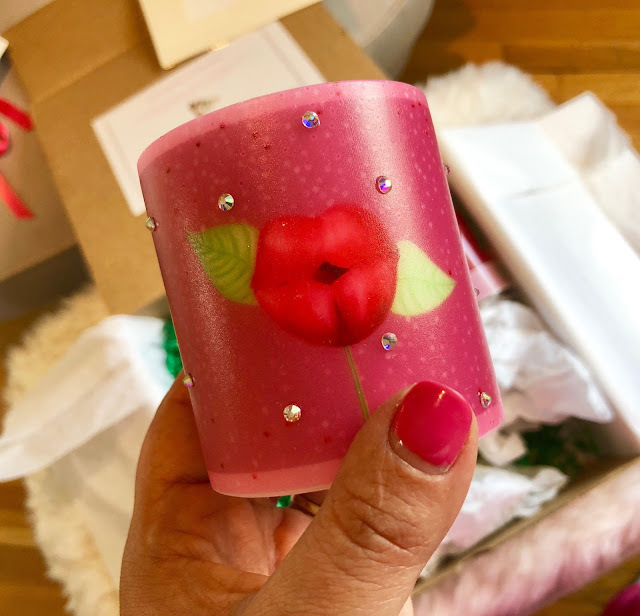 The Forever in Bloom box is such a great idea for Mother’s Day! Ok, so I got out my craft box today! Thanks for the inspiration! Isn't there something to be said about giving #handmade #gifts or #gifs ? I love receiving homemade gifts. This is a great giveaway Thanks for the chance to win! I would love to receive this beautiful Mother’s Day box. It is so thoughtfully put together with wonderfully unique pink themed products. These scarves sound like a terrific gift for Mother's day! I'm definitely taking a look. Your gift boxes would be very well received at my house. Mother Day is a big day at our house. Thanks for sharing. I wonder what's the best #MothersDay gift you ever received? =)💎? 🛣? 👗?🗼? Being a mom of teen twins is wicked hard! Milo & Such, a scarf and in pink is Fantastic. I was just looking at Silk Scarves made by your own design on Facebook, with Jennifer & Silk Avenue Scarves! Wonderful, Unique and Last a Lifetime Gifts are the Ultimate Best! Its nice to read this. Oh my, what to get my mother this year??? Inspiring post!! That red candle is calling to me! Happy Heavenly Mother's Day Mom...I miss you very much! I am new to blogs, and this is woderful! Happy Mothers day. Breakfast in bed! My sweet mother would love these. Thanks! All women love gifts. Mom would love this one. This is a very nice mothers day gift idea! I love this it's so nice. The candle looks so lovely and something different. I love the pink lips silk scarf. The design is lovely and unique. The candle with the sparkles is so cute. My mom likes all things sparkly! A recent discussion between me and my friends about giving Islamic gifts to each other for birthdays and other special occasions led me to think as to why is it that these types of presents are so important to us. Great ideas for Mothers Day.Thanks for sharing! 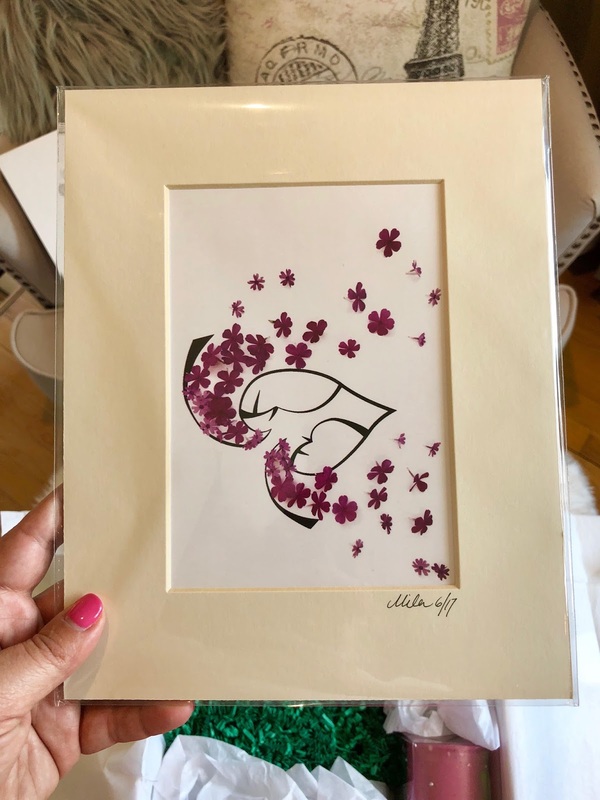 This is such a great idea for Mother’s Day. I would love to receive such a beautiful and thoughtful gift. Mila & Such put together a wonderful selection of gifts in this box! It is so nice that you don't even need to add a card because the inner flap of the box already has an adorable one! Mothers' Day is very Special. For mothers day flowers are the best gifts. when we gift flowers to someone its like gifting fragrance of love finding the best flowers gifts also important to know more about flower gift ideas. This was such a great Mother’s Day gift. Any ideas for Father’s Day? I missed this for Mothers Day, but some great ideas for my Mom's upcoming birthday! These are some questions that was put before some married couples and the recurring issue was the inability of nursing mothers to bathe newborns together with the desire of the extended family to share in the joy of childbirth and parenthood. Actually, my mom likes jewelries very much. So, on every mothers's day, I present her different-2 varieties of jewelries. I love my mom. She is an angel for me. This is a good idea for my gift to my daughter. She loves anything that is color pink. This is all her collection of pink. Group it with level front pants or a slick skirt and you'll immediately have beauty treatment outfits that catch the marvelousness,Diane Keaton Anti Aging Products effortlessness and chic of this present pattern consummately.